Don't be foiled. Know the risks. Long known as a neurotoxin, many scientists suspect aluminum is linked to such modern scourges as breast cancer, Alzheimer's disease, allergies and autism. The Age of Aluminum profiles people whose health has been seriously impacted by unwitting exposure to aluminum, along with the leading scientists as they explore the links between this known neurotoxin and a growing epidemic of chronic illnesses and disabilities. 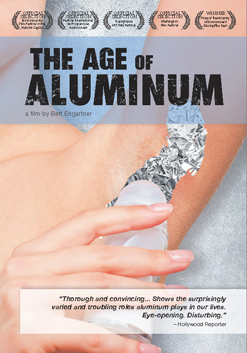 For those seeking answers to why breast cancer, dementia, autism, autoimmunity, allergies, and chronic fatigue are on the rise, The Age of Aluminum is a must-see film. Fact: Two-Thirds of deodorants contain aluminum compounds as active ingredients. Fact: Of the 32 currently recommended vaccines for children in the U.S. 18 contain aluminum. Fact: Aluminum has demonstrated it can generate a spectrum of disorders affecting many different systems. DOWNLOADABLE SCREENING GUIDE & PUBLICITY MATERIALS AVAILABLE. "Highly Recommended. The film juxtaposes high praise for aluminum's role in the many amenities of modern life with the unstated downside, the dirty little secret... Perhaps the most challenging, and interesting, aspect of the film is the appearance of dueling experts - highly trained scientists on both sides of the issue." "Thorough and convincing... shows the surprisingly varied and troubling roles aluminum plays in our lives. A film that strongly deserves wider exposure. Eye-opening. Disturbing." "The Age of Aluminum puts us on notice. The evidence is alarming, yet the film's approach... is an even-keeled, determined story line." "Eye-opening and deeply sad, pointing out that we are indeed the architects of our own destruction, seeing convenience and ease, despite the destruction that it causes to ourselves and to the planet as a whole." "This visionary film makes a powerful statement... From the intelligent narrative and beautiful cinematography to moving profiles of people, who have suffered greatly, Age of Aluminum is an unforgettable wake-up call and a film everyone should see."